Gigantic corpse flowers take their name from the rotting stench they emit when they bloom – a two-day spectacle that only happens every few years. Very few of us will ever see or smell one in person. 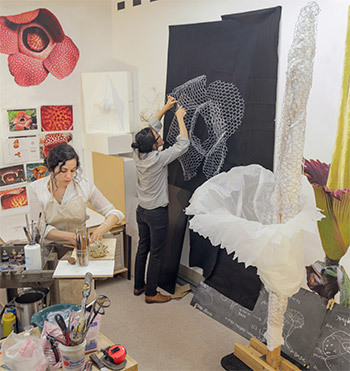 But in a UC San Diego department of visual arts research lab, artist MR Barnadas is creating life-size models of two varieties of the plant, which can grow to 10 feet tall or more. “In the broadest sense, this is an effort to explore ways of representing nature utilizing emerging technologies,” she said. “This includes the creation of two highly detailed, computer-processed, 1:1 reproductions of the world’s two largest botanical blooms – Amorphophallus titanum and Rafflesia arnoldii – increasingly rare because both of them are endangered species.” Barnadas plans to be on hand when Amorphophallus blooms at UC Davis Botanical Observatory this summer, and she’ll also travel to Bengkulu, Indonesia this fall to witness a flowering Rafflesia. Her project is among many hybrids that have begun to blossom since the opening in 2012 of the Structural and Materials Engineering Building (SME) at UC San Diego. SME is shared by the visual arts department and the Jacobs School of Engineering. “By collaborating with engineers, designers, urban planners, computer scientists and other specialists, we want to produce new forms of art, analysis, and cultural intervention,” said Jordan Crandall, chair of the visual arts department. SME is equipped with cutting-edge technologies such as the KUKA robotic mill that is vital to Barnadas’ work. The mill is similar to robotic arms used on automobile assembly lines except that instead of precise spot welding, UC San Diego’s KUKA can carve complex forms, guided by 3D computer designs. This spring, Barnadas is conducting a 15-week class in the robotics lab that is limited to four mechanical engineering seniors. Barnadas said they have begun sculpting small models in clay, collecting plant samples, and translating them into 3D digital models using 3D scanning. These digital models will be used to make full-size models using the KUKA 7-axis robotic mill. Meanwhile, artist Michael Trigilio, associate teaching professor of visual arts, lifted his gaze toward the firmament with the interdisciplinary Project Planetaria. At last fall’s Without Walls festival on campus, he presented the latest installment: “Our Star Will Die Alone,” a collaboration with UC San Diego astrophysicist Adam Burgasser from the physics department and filmmaker, animator and projection designer Tara Knight, assistant professor of theatre and dance, who also happens to have a master’s degree in visual arts from UC San Diego. “Our Star” resulted in a multimedia performance (with Trigilio on electric guitar) centered on music the artist composed in response to Burgasser’s data derived from the wavelengths of light from a dying star. And in more terrestrial realms, various interdisciplinary research in the visual arts department addresses the conditions and challenges of modern cities. Architect, artist and UC San Diego professor of visual arts Teddy Cruz’s research at the Center for Urban Ecologies at SME “explores ways in which new synergies across engineering, architecture, urbanism, visual arts and humanities can tackle pressing global socio-economic, urban and environmental issues though the lens of local and regional conditions,” he said. The workshop was coordinated by Cruz and Fonna Forman, political science professor and co-founder of the Center on Global Justice at UC San Diego, with support from UC San Diego’s Blum Cross-Border Initiative on border poverty. In Weimar, Germany last summer, visual arts master’s degree candidate Kate Clark was in residence at the famed Bauhaus arts and design school as part of an ongoing collaboration between the German institution and UC San Diego. Clark joined an international team that looked at the design of a new shopping mall proposed for downtown Jura, near Weimar. Her group was tasked with dreaming up uses for a vacant lot next to the mall. The goal was to find a use that would help connect the large mall with the surrounding historical neighborhood. The Bauhaus exchange goes both ways. Last September, Lisa Glauer, artistic assistant for public art and new artistic strategies at the Bauhaus, was in residence at the Experimental Drawing Studio at SME, which is led by UC San Diego professor of visual arts Amy Adler. Glauer interacted with faculty and students as she created images using human breast milk. Glauer is fascinated with the idea that while a mother’s milk signifies love and nurturance, it can also be harmful when it becomes tainted, and the San Diego/Tijuana border region has one of the highest rates of breast milk contamination. In a studio at SME, Glauer used an iron to spread the milk across broad pieces of fabric, creating sepia-toned patterns. Beneath the patterns were faint maps of the border region. And this fall, Ursula Damm, Bauhaus director of media art and design, is set for a residency at SME this fall. She plans to work on “the calculations of nature,” a project that juxtaposes the workings of the natural world with the mechanisms of digital culture and communication. In the months and years ahead, additional collaborations among artists and unconventional partners are expected to produce surprising results. Visual arts department initiatives launched to take advantage of SME’s interdisciplinary culture and state-of-the-art equipment include Active Structures and Materials, the Arthur C. Clarke Center for Human Imagination, the Center for Design and Geopolitics, the Experimental Drawing Studio, the Experimental Media Lab and the Experimental Sculpture and Painting Production Studio.